Searching for a fresh and flavourful salmon recipe? 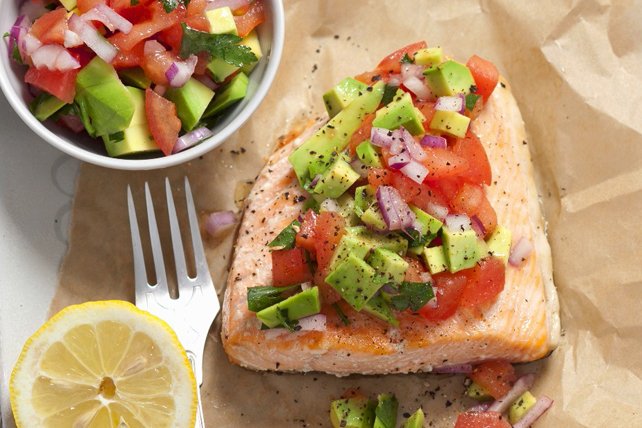 Our Baked Salmon with Avocado and Tomato Salsa is both delicious and easy to make. Bonus - it's ready to enjoy in about 30 minutes. Place fish, skin side down, on parchment-covered baking sheet; brush with 1 Tbsp dressing. Bake 17 to 19 min. or until fish flakes easily with fork. Meanwhile, combine remaining dressing with tomatoes, avocados and onions. Top fish with tomato mixture. Serve with lemon wedges. Serve with hot cooked rice and a tossed green salad. Heat greased barbecue to medium heat. Prepare recipe as directed, except grill the fish instead of baking it on the parchment-covered baking sheet.